Don't you just love this part? I absolutely love... please do spill the beans so I can make one too! It turned out so gorgeous! Oh, wow. Beautiful, Jared! And I love the serene color. It looks so snuggly. lovely, lovely, lovely! How large did it come out? Very pretty! And such a relief that you didn't write "taunt." The substitution of "taunt" for "taut" must be my number-one-least-favorite common mistake with the English language. 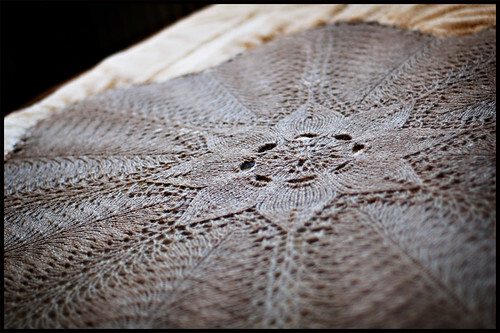 looks like perfection, i love circle knitting so much and this is divine. 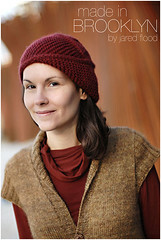 I also LOVE the sweater in Interweave. Congratulations! Oh yes I do! I can hardly wait to do the same. It's hard to judge the size from these pics, it's so in proportion to itself. I'm looking forward to the big reveal. Yes. I love that part. Wow that's pretty. Love the yarn too. It looks amazing already. Did you reach blanket size? Are you sure you didn't mean taunt? Your pictures (and your knitting, of course) are always SO beautiful! Ooh, blocking magic! You cruised on that lace pattern! Gorgeous -- but I have to admit, I kind of like the unblocked version! Holy S man! that is incredible. Gorgeous. I want one! SPill the details, please. That is really something! Wow. It's a new direction for you. Stunning. I love it! I also plan to knit Cobblestone for myself and then maybe for the guys in my life! You are a very talented knitter and your photography is terrific too! Spill the beans! I love it! I have some yummy yarn calling out to me! Bellissimo! Ma quanto è grande? you take the SEXIEST photos of knitting - they are gorgeous! so sensual! you're the only person I can think of who would make a grey doily and have it look just right. congrats! I am totally drooling. It's gorgeous! 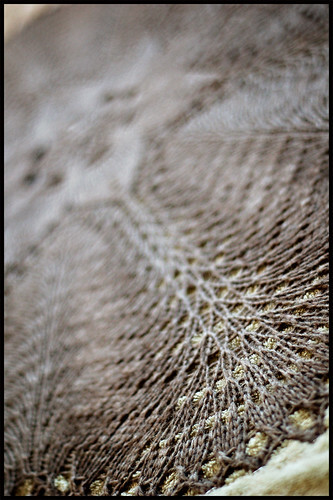 Your photography makes me swoon, as does your luscious knitting. Beautiful job, and I'm very VERY glad I found your blog. So my lineup of projects is basically a recapitulation of everything you've made in the last few months. I can't wait to get the specs on your beautiful blanket. Your knitting is exceptional. You should be very proud. It's gorgeous! Your photos are beautiful, as well. how are you blocking it and how big is it? I just squealed a little bit. OMG THAT IS SOOO PRETTY!!! Damn. You knit fast. I am anxious to see modeled shots! I'd certainlky love t ohave your talent with those needles! Did the beer help? The AC? It's just so beautiful! wow.. amazing! and I love your sweater in the new IK... thinking of making it for my hubby! it is absolutely beautiful! Now I want to make one too!!! ooh.. I do. I can't wait to get back to my yarn in Ohio and get to that point with my project! So pretty. Is it the back side of your wool flower (that sounds kinda dirty)? Mary's comment above is hilarious. Beautiful. I love well photographed knits. How big is this thing? I love the texture and the colour, really great with that flower pattern. But what will it become out of it? It looks so finished already, but I recall you said it was going to become a blanket? Nice however, as a table cloth or as blanket!!! looks great ! Il est magnifique ! this is just absolutely gorgeous! are you going to post the pattern you're using? btw - love your knitting, blog and photos! wow, I just love it!!!!!!! Blocking: when all is revealed. Yes, that's probably the best part (next to wearing/wrappng/using). It's beautiful! I wait with bated breath for the directions! It's so spectacular it doesn't even look real . . . beautiful. your pictures always amazes me. I wish you could take some pictures of my stuff so I can get as popular as you are! 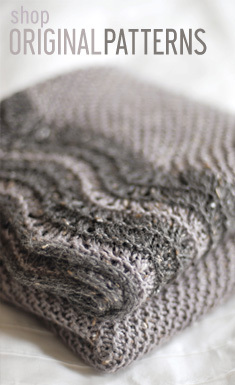 I read knitting blogs every day hoping to run across a 'juicy' one: a pattern find, a wonderful FO that's an inspiration, the thrilling modifications the blogger generously shares. Your entry fits all my definitions. Thanks for being out there in blogland. Your lap blanket is wonderful. Beautiful -- I'll be digging out the old doily patterns with new interest as autumn sets in!! it's just lovely. My kid wants a new blanket and I'm trying to decide if i love her enough to knit lace. that's awesome. now i'm inspired to try some different patterns with worsted weight and big needles. 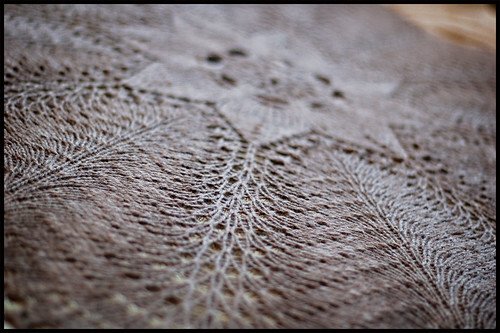 i'm doing two shawls with cobweb weight and i have tons of needles smaller that a size 5, so it'd be a welcome change. You are brilliant and an inspiration! It is gorgeous. You inspire me to attempt to make a lap blanket. Another perfect rendition of two old standards! I love fan & feather and have used it often but never to this, amazing end! Enjoy it this Fall and congrats on grad school. Does it say anywhere how much yarn you used? Or what sized needles? That is so gorgeous that I want to make one myself. If it says that and I missed it, I apologize. Um, yes, it does say. Guess I just hadn't read far enough yet . . . .